When you are going to your fourth team in four years, the two things you are looking for are stability and familiarity. 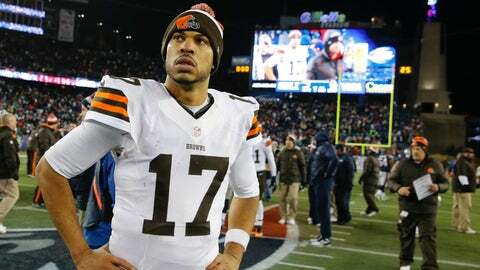 Jason Campbell appears to have found both with the Bengals. Cincinnati signed Campbell to a one-year deal on Thursday, which is its first signing of the free-agency period. Campbell was released by the Browns on March 12. The signing reunites Campbell with Bengals offensive coordinator Hue Jackson. The two were in Oakland in 2010-11 when Campbell had his longest run of success. "Talking to my agent I wanted to be somewhere where there was structure and a familiar face. I’m not starting out from scratch," Campbell said. The Raiders acquired Campbell from the Redskins in 2010. In 18 starts with Oakland, Campbell was 11-7 with 19 touchdowns and 12 interceptions. In 2011, he threw for 300-plus yards in two of the first five games. Then came the broken collarbone in a Week 6 game against the Browns, which ended Campbell’s season, and the course of two franchises changed as the Raiders acquired Carson Palmer for a first- and second-round pick. The following season, the Bears signed Campbell before his stint with Cleveland. "The year before we arrived, they were the 30th-ranked offense. Then Hue got to Oakland and ended up as a top five rushing offense and top 10 scoring offense before injuries and everything took over," Campbell said. Before the Bengals faced the Browns in Week 11 last season, Jackson talked about how much respect he had for Campbell. "I’m very fond of Jason. He came to Oakland with me and helped get that offense back on track. I’ll always have a lot of respect for him. It didn’t turn out the way me or him wanted it to," Jackson said. "It says a lot about the man because most people can’t handle going from team to team, coordinator to coordinator. He’s handled that like a champ. I knew he would." Campbell’s main task will be as Andy Dalton’s backup and to serve as a mentor in the quarterback room. He hasn’t had a chance to talk to Dalton yet. "A big part of Hue’s offense will take pressure off Andy and A.J. (Green). Everything starts with the run game, getting 3-4 yards and manageable downs and distance," Campbell said. "That opens up play action and those things can still win games. You can throw it 40-50 times but not win games." Last season with the Browns, Campbell completed 180-of-317 passes for 2,015 yards, with 11 touchdowns and eight interceptions. His lone win for Cleveland was in Week 9 against Baltimore, when he threw for 262 yards and three touchdowns in a 24-18 win over the Ravens. For that effort, he was the AFC Offensive Player of the Week. The other thing Campbell gives the Bengals is possibly their best backup since Jon Kitna. For a team that has been fortunate in avoiding injuries to its starting quarterback (with the exception of Palmer in 2008), Campbell has a consistent track record. Of the 86 games the 10-year veteran has played, 79 have been starts. "Jason obviously has extensive playing and starting history and as a back up he can provide the stability and experience we’re looking for in that role.," said Bengals head coach Marvin Lewis in a statement. "He can play and win games for you if you need him. He’s got great stature and strength, the ability to stand in there under pressure and really throw the ball down the field." Besides being reunited with Jackson, Campbell is familiar with a couple other people in Cincinnati. UC football coach Tommy Tuberville was Campbell’s coach at Auburn and Campbell went to the same high school in Taylorsville, Miss., as Reds center fielder Billy Hamilton. Campbell said he is looking forward to seeing Hamilton play and steal bases. Hamilton was recruited to play football at Mississippi State but Campbell thinks Hamilton ended up making the right decision. "With the guaranteed money and less wear and tear, baseball was better," Campbell said. "He was a fast receiver in high school. Exciting player to watch and really knew how to use his speed. They would have used him in the slot at the college level and might have had a chance in the NFL."